Born in 1947, to a Derbyshire mother & Yorkshire father. Bred in England’s East Midlands at Creswell near the junction of three counties, In Derbyshire but with a Nottinghamshire address and a Yorkshire postcode! Creswell is famous for the discovery of Ice age man in The Crags, the pit disaster on my sisters fifth birthday and The Brass Band. 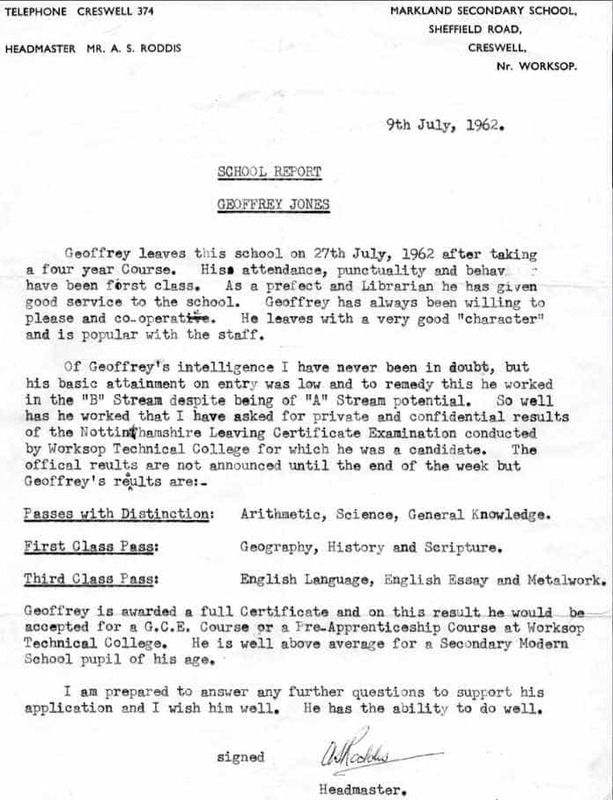 Educated in the ‘B’ stream at a brand new secondary modern, leaving full time education a day before my fifteenth birthday, after achieving the highest grades in the North Nottinghamshire School Leaving Certificate. Starting my interest in business by selling sweet chestnuts and conker trees at school plus helping my school caretaker father. I then worked for the Steetley refractory brick company in their research labs. at Worksop, doing high temperature testing and x-ray crystallography of refractory bricks under Stafford Scholes. Leaving home at age 19 to be a research assistant at The Cavendish Laboratories in Cambridge (In the Metal Crystals section under Mick Brown and Archie Howie). Where initially I developed crystal growing furnace controllers and then instrumentation for the worlds first Scanning Transmission Electron Microscope , the HB5. (A new technique for the scanning and absolute calibration of electron energy loss spectra – Ultramicroscopy, 1981 – Elsevier). Using day release and evening study I achieved a Polytechnic Diploma in Metallurgy at City of London Polytechnic in June 1972. In my spare time I started up a scrap recycling electronics components business, followed by designing, manufacturing and selling with Jake (Pete) Chapman the first multichannel disco sound operated flashing light system which we sold commercially and also used at a private May Ball for HRH Prince Richard, Duke of Gloucester at Barnwell Castle. Set up a sole trader, soft start business, in 1970 manufacturing instruments such as motor controllers, Image Intensifiers using channel plates, Digimeters (Picoammeters), Scandrives (microprocessor controlled motorised microscope stage controllers), IMAS (Image enhancement), and backscattered electron detectors created out of work at Cavendish. Initially for Terry Brown and then Cambridge Technology my first customers. Forming a partnership with Pat Heslop-Harrison and Nick Toop in 1983 to develop an aircraft de-icing pump controller (from a contact I made whilst walking Hadrians wall) which then led onto CMM components and finally to the current product range see Cortex Controllers website. Developed the Cortex range of stepper motor driven rotators to aid optical inspection of jet engines, now used by all major airlines and military air forces globally. Negotiating with Olympus to take worldwide distribution rights. Sold my share of Cortex Controllers on July 1 2004 to Nick Toop. So I could spend more time walking and using the latest Web2 technologies eg RSS feeds, Blogging, tagging, twittering etc etc. Currently also helping to mentor other start ups in Cambridge UK. I organised one of the first blogging conferences in the UK , Our Social World .on September 9th 2005 in Cambridge, UK. Using WordPress for the first time. Mr. Jones that is quite an impressive resume that you have there. Your picture implies that you are an avid hiker too. The best of health to you! Do you know Harrison? He was your classmate? Can you please contact me with details on how to purchase your plans for the V bed. Just wondering when the Pilates bed design became a reality? Really interested in the bed… would love to try it out! Been talking to a client about it today. Hi, Geoff. I came across your blog while researching the the South West Coast Path. Thanks for posting your experience. Thinking about walking it next year. But I had to leave a comment after clicking on your spreadsheet (linked in your Day 2 post). Finally, someone who loves and collects data as much as I do. For a second I thought I had clicked on one of my spreadsheets. Now back to reading . . .